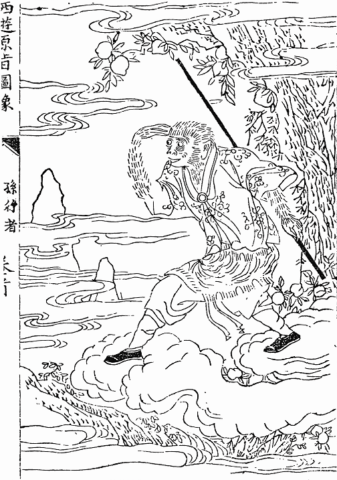 Sun Wukong (孫悟空), the Monkey King, is one of the most enduring characters of East Asian literature and folklore. Much ink has been spilled in the analysis of the novel in which he appears, the highly popular Ming Dynasty (1368-1644) classic Journey to the West (西游記, Xiyouji) (1592). For instance, Anthony C. Yu’s updated translation includes an almost 100 page introduction highlighting the historical background and religious and literary influences of the novel. The origins of Monkey has also been discussed at great length. However, no scholars have attempted to trace the origins of his magical iron staff, the most recognizable part of his iconography. In this paper, I propose that the weapon is an amalgam of ringed staves carried by religious monks and iron staves carried by martial monks. Both are featured in Chinese fiction and religious-inspired martial arts legends. My hope is that this information will be both useful to researchers and interesting to fans of Ol’ Monkey. A 19th-century woodblock print of Sun Wukong and his staff. The staff first appears in the third chapter when Monkey goes to the underwater kingdom of Ao Guang (敖廣), the Dragon King of the Eastern Sea, looking for a magic weapon to match his supernatural strength and martial skill. When all of the traditional magic weapons—a scimitar, a fork, and a halberd weighing thousands of pounds each—fail to meet his standards, the dragon queen suggests to her husband that they give Sun “that piece of rare magic iron” taking up space in their treasury. She claims that the ancient shaft had started producing heavenly light days prior and proposes that the monkey is fated to own it. The novel never explains how the pillar was made, only that it was originally used by Yu the Great (大禹), a semi-historical Chinese emperor, to measure the depths of the world flood during times immemorial. [Sun Wukong] held the treasure [the staff] in his hands and called out, “Smaller, smaller, smaller!” and at once it shrank to the size of a tiny embroidery needle, small enough to be hidden inside the ear. Awestruck, the monkeys cried, “Great King! Take it out and play with it some more.” The Monkey King took it out from his ear and placed it on his palm. “Bigger, bigger, bigger!” he shouted, and again it grew to the thickness of a barrel and more than twenty feet long. He became so delighted playing with it that he jumped onto the bridge and walked out of the cave. Grasping the treasure in his hands, he began to perform the magic of cosmic imitation. He bent over and cried, “Grow!” and at once grew to be ten thousand feet tall, with a head like the Tai Mountain and a chest like a rugged peak, eyes like lightning and a mouth like a blood bowl, and teeth like swords and halberds. The staff in his hands was of such a size that its top reached the thirty-third heaven and its bottom the eighteenth layer of Hell. Tigers, leopards, wolves, and crawling creatures, all of the monsters of the mountain and the demon kings of the seventy-two caves, were so terrified that they kowtowed and paid homage to the Monkey King in fear and trembling. Presently he revoked his magical appearance and changed the treasure back into a tiny embroidery needle stored in his ear. Sun later uses this powerful weapon in his war against heaven when they don’t recognize him as a full-fledged god. He is so powerful that the Jade Emperor (玉皇帝) of heaven has to ask the Buddha to intervene. After being imprisoned beneath a mountain range for 500 years, Monkey is eventually released and takes the tonsure as a Buddhist monk. He is charged with the protection of the monk Xuanzang (玄奘) on a journey to retrieve Buddhist scriptures from India. He uses his staff to battle all sorts of monsters, spirits, and rogue gods along the way. 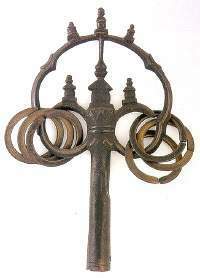 A ringed monk’s staff (khakkhara). The earliest depiction of the staff appears in the oldest edition of Journey to the West, the Master of the Law, Tripitaka of the Great Tang, Procures the Scriptures (大唐三藏取经诗话, Da Tang Sanzang qujing shihua), published during the late Song Dynasty (960-1279). In the second chapter, Sun takes Xuanzang to heaven to meet Vaisravana, the Mahabrahma Deva. After the monk impresses the heavenly retinue with his lecture on the Lotus Sutra, Monkey is given a cap of invisibility, an alms bowl, and a golden ringed monk’s staff (khakkhara) as magical weapons against the evils they will face on their journey to India. Sun later uses the staff in a battle with a white-clad woman who transforms into a tiger demon. He changes the staff into a titanic red-haired, blue-skinned yaksha with a club, showing that the predecessor of the Compliant Rod has more magical abilities in comparison. A weapon that predicts the Compliant Rod is mentioned early on in the Master of the Law. Monkey describes how the Queen Mother of the West (西王母), a demon-like goddess originally worshiped in ancient China, had him flogged with an “iron cudgel” (鐵棒) for stealing ten peaches from her heavenly orchard. He later borrows the cudgel to use in tandem with the monk’s staff to punish nine dragons. The golden rings (金环, Jinhuan) on the monk’s staff most likely influenced the golden hoops (金箍, jingu) on the weapon from the Ming version. Therefore, both staffs from the Song version were combined to create the Compliant Rod. Many scholars believe that Sun Wukong was influenced by the monkey god Hanuman from the Indian epic the Ramayana (3rd-century BCE). The two have many textual similarities, but weapons are not among them. Despite his traditional iconography, the Ramayana doesn’t mention Hanuman wielding a mace. His later association with this weapon may have been influenced by two sources. First, the novel portrays him as using his great strength to wield heavy objects, both natural and man-made, as blunt weapons. Second, he was closely associated with yaksha demons in other great Hindu classics like the Mahabharata (3rd-century BCE). Early Buddhist sutras mention yakshas wielding maces. One such individual is the Yaksha King Kubera-turned-Buddhist deity Vaisravana, who later makes appearances in the Master of the Law and Journey to the West. The mace was a fixture of Hanuman’s iconography by at least the 12th-century since dynastic coins from this time feature him holding the weapon. However, the association between the two surely took place well before this if the iconography was common enough to stamp on coins. Yet, I am not inclined to speculate that stories of his mace eventually made it to China. Monkey’s weapon may have just been influenced by Buddhist yakshas as well. As previously mentioned, Sun becomes a Buddhist monk after being released from imprisonment. Meir Shahar explains that the staff was the emblem of the monk. It was a part of the eighteen items that Indian Buddhist monastic law required that they carry with them on the road. In China, there were two different kinds of monks (with some overlap), the lesser known martial type charged with protecting the religious community (sangha) and the more widely known religious type living in cloisters and proselytizing on the road. Both groups carried different kinds of staves. The martial monks wielded the wooden or iron kind. The former was chosen for its diminished capacity to kill unlike edged weapons, while the latter was used for killing during times of war. The religious monks carried the aforementioned ringed kind. 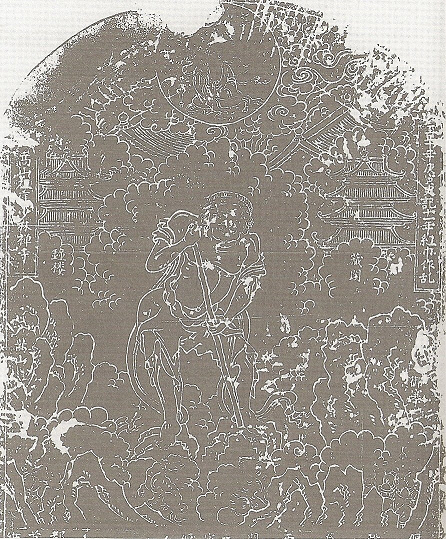 The 1517 Shaolin stele featuring Vajrapani. The martial monks of the Shaolin Monastery, for example, are famous for their skill with the staff. It’s interesting to note that they venerate the yaksha-turned-Buddhist protector deity Vajrapani as the progenitor of their staff method. A stele erected in 1517 tells the story of how the deity, disguised as a lowly kitchen worker, grew to titanic proportions and wielded a fire poker as a makeshift staff to defend the monastery against rebels during the late Yuan Dynasty (1271-1368). Buddhist iconography traditionally depicts Vajrapani wielding a mace in defense of the Buddha and his teachings (the dharma). The Shaolin monks may have changed his mace to a staff because this was the blunt weapon with which they wielded in defense of the religious community and, by extension, the Buddha and his Word, as well as in defense of China against rebels and foreign invaders. Shahar suggests that “martial deities such as Vajrapani exonerated the monks from their responsibility for the creation of military techniques.” He continues, “In this respect their legends could be read as Buddhist apologies for the monastic exercise of violence.” Therefore, I suggest that Monkey’s iron staff from the Master of the Law is based on the staves used by martial monks. After all, Sun is a Buddhist warrior just like the monks of Shaolin, and he uses his iron staff to meter out punishment and death just like Vajrapani and his mace. The ringed staves were known as “xi staves” (錫杖, khakkhara), which early medieval Chinese documents describe as being decorated with six to twelve metal rings. These rings were designed to make a clanging noise (錫, xi) to not only scare away any poisonous animals on the road, but also to alert possible donors to the monk’s presence. Noted Buddhist personages and deities were often portrayed as having the same ringed staff and alms bowl given to Monkey in the Master of the Law. For instance, a popular story circulating during the Song involves Mulian (目連, Maudgalyayana), a close disciple of the Buddha, using the magic power of the aforementioned objects to free his deceased mother from the torments of the underworld. The Compliant Rod from Journey to the West is based on two staves from an earlier Song-era edition of the story. The first is a golden ringed monk’s staff given to Monkey by the deva Vaisravana (among other objects) as a magical weapon to protect the monk Xuanzang. The second is an iron staff procured by Monkey from the Queen Mother of the West in order to punish nine dragons. The former is based on ringed staves historically carried by religious monks while proselytizing on the road. The ringed staff is among the magic items used by Buddhist personages and deities in Song-era stories. The latter is based on wooden and iron staves historically used by martial monks to defend both the Buddhist community and China from rebels and foreign invaders. Martial monks, such as those from Shaolin, attributed their staff skills to mace-wielding yaksha demons-turned-Buddhist protector deities as way of excusing their use of violence. Likewise, Monkey’s use of violence is excused because he wields his staff in protection of his master Xuanzang. In the end, both staves were combined in the Ming version. The golden rings of the ringed staff were transposed onto the iron staff. The Compliant Rod therefore inhabits the worlds of heaven and hell, religion and combat, salvation and punishment. The staff influenced the weapon used by the humanoid alien Son Goku (himself based on Sun Wukong), the main character of the Dragon Ball franchise. It is named Nyoi Bo, the Japanese transliteration of Ruyi bang (如意棒, Compliant Rod), and is commonly called “Power Pole” in English language media. The staff is given to him as a child by his grandfather Gohan, a human who adopts and teaches him martial arts. Was forged in the stove by Laozi himself. To fix the Eight Rivers and Four Seas’ depth. Its two ends were clamped in pieces of gold. On it dragon and phoenix scripts were drawn. I just posted the third and final installment of my investigation on the history of Monkey’s staff. It can be read here. By Great Yu himself, the god-man of old. Were fathomed and fixed by this very rod. Wu Cheng’en, and Anthony C. Yu. The Journey to the West (Vol. 1) (Chicago, Ill: University of Chicago Press, 2012), 1-96. See, for instance, Ibid, 8-15 and the sources therein. Yu the Great is believed to have ruled during the 22nd century BCE. The novel, however, does not follow a historical chronology. Yu is just portrayed as inhabiting a mystical time in the distant past. Wu and Yu, The Journey to the West, 135. Anthony Yu’s original translation uses the word “pounds.” However, Chinese versions of the novel use jin (斤), known in English as “catty.” Catty and pound are two different measures of weight, the former being heavier than the latter. Therefore, the English text has been altered to show this. The catty during the Ming Dynasty when the novel was compiled equaled 590 grams (Mark Elvin, The Retreat of the Elephants: An Environmental History of China (New Haven (Conn.): Yale university press, 2004), 491 n. 133). Meir Shahar, The Shaolin Monastery: History, Religion, and the Chinese Martial Arts (Honolulu: University of Hawai’i Press, 2008), 93. This is also known as the “Kōzanji Version” (高山寺) because a 17th-century document mentioning the work was discovered in a Japanese temple of that name (Victor H. Mair, The Columbia Anthology of Traditional Chinese Literature (New York: Columbia University Press, 1994), 1181). Dudbridge, The Hsi-Yu Chi, 32 and 35. Ibid, 38. For a comparison between the Chinese names of the Song and Ming weapons, see Shahar, The Shaolin Monastery, 107-108. These similarities include being monkey protagonists and having births associated with wind, episodes of upsetting cosmic order in their youths, and comparable powers of transformation and flight. Bits and pieces of the Ramayana arrived in China in the form of Buddhist sutras from the north via the Silk Road and word of mouth from Southeast Asian merchants via the southern sea route. It then mixed with indigenous Chinese stories concerning water spirits and ape demons to influence the creation of Sun Wukong. For more details, see Hera S. Walker, “Indigenous or Foreign? A Look at the Origins of the Monkey Hero Sun Wukong”, Sino-Platonic Papers 81 (September 1998): 1-110, accessed February 20, 2014, http://sino-platonic.org/complete/sp…sun_wukong.pdf. Philip Lutgendorf, Hanuman’s Tale: The Messages of a Divine Monkey (Oxford: Oxford University Press, 2007), 41 n. 9. He appears as the heavenly general Li Jing (李靖) in the Ming version. Shahar, The Shaolin Monastery, 102. Shahar mentions a Shaolin monk who used his iron staff to kill the wife of a rebel during the Ming dynasty (Ibid, 69). Ibid, 37. For a story of Vajrapani defending the Buddha, see Vessantara, Meeting the Buddhas: A Guide to Buddhas, Bodhisattvas, and Tantric Deities (Birmingham [England]: Windhorse Publications, 1998), 162. For instance, one story tells how Vajrapani kills a Hindu deity in order to revive him as a Buddhist deity. This is connected to the concept of skill in means in which an evil being is killed in order to save them from karmic punishment in the next life (Mark Juergensmeyer, Margo Kitts, and Michael K. Jerryson, The Oxford Handbook of Religion and Violence (New York: Oxford University Press, 2013), 55). Shahar, The Shaolin Monastery, 103. Dudbridge, The Hsy-Yu Chi, 32 n. 6. For a full version of the story, see Mair, The Columbia Anthology of Traditional Chinese Literature, 1093-1127. Mark I. West, The Japanification of Children’s Popular Culture: From Godzilla to Miyazaki (Lanham: Scarecrow Press, 2009), 203. Brian Camp and Julie Davis Anime Classics Zettai! : 100 Must-See Japanese Animation Masterpieces (Berkeley, Calif: Stone Bridge Press, 2007), 112. Akira Toriyama and Gerard Jones, Dragon Ball (Vol. 2) (San Francisco, Calif: Viz LLC, 2003), 4. Wu and Yu, Journey to the West (Vol. 3), 375. Camp, Brian, and Julie Davis. Anime Classics Zettai! : 100 Must-See Japanese Animation Masterpieces. Berkeley, Calif: Stone Bridge Press, 2007. Juergensmeyer, Mark, Margo Kitts, and Michael K. Jerryson. The Oxford Handbook of Religion and Violence. New York: Oxford University Press, 2013. Lutgendorf, Philip. Hanuman’s Tale: The Messages of a Divine Monkey. Oxford: Oxford University Press, 2007. Shahar, Meir. The Shaolin Monastery: History, Religion, and the Chinese Martial Arts. Honolulu: University of Hawai’i Press, 2008. Toriyama, Akira, and Gerard Jones. Dragon Ball (Vol. 2). San Francisco, Calif: Viz LLC, 2003. Vessantara. Meeting the Buddhas: A Guide to Buddhas, Bodhisattvas, and Tantric Deities. Birmingham [England]: Windhorse Publications, 1998. Walker, Hera S. “Indigenous or Foreign? A Look at the Origins of the Monkey Hero Sun Wukong.” Sino-Platonic Papers 81 (September 1998): 1-110. Accessed February 20, 2014. http://sino-platonic.org/complete/sp…sun_wukong.pdf. West, Mark I. The Japanification of Children’s Popular Culture: From Godzilla to Miyazaki. Lanham: Scarecrow Press, 2009. Wu, Cheng’en, and Anthony C. Yu. The Journey to the West (Vol. 1-4). Chicago, Ill: University of Chicago Press, 2012.